St Norbert was born in Xanten in Germany in 1080AD. He was the third son in a family which was wealthy and related to the Emperor, Henry V.
Norbert, who was a brilliant student during his years of study, spent most of his early life enjoying the pleasures of the Imperial Court. 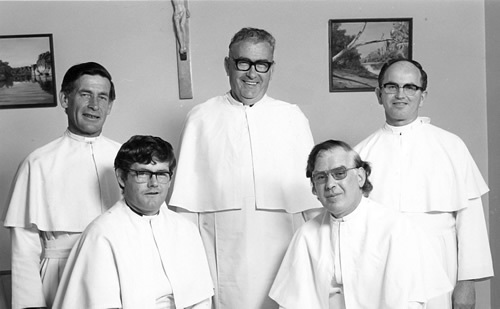 Through the influence of his family he obtained a financial subsidy from the parish church at Xanten when he accepted ordination to the subdiaconate. At that time Church affairs were very much under the influence of the wealthy nobles who formed the government. Norbert came to realise that it was important for the preaching of the gospel that the Church should be independent of these influences. Over time Norbert was filled with the burning desire to make Christ known and he removed himself from his former lifestyle and devoted all he had and all he was to God's service. This meant a life of prayer and penance and subsequently Norbert was ordained a priest. Norbert's ministry of preaching saw him being sought by Bishops to help reform the clergy, so that they too might be more effective ministers and preachers. Unfortunately, local clergy were often disturbed by Norbert's reform and many found it difficult to change dramatically. However, Norbert's preaching had attracted some followers, and with these he went to the valley of Prémontré, and became the first Norbertine or Prémontratensian Community, a small group of men committed to seeking Christ by means of community living, poverty, obedience, celibacy and a dedication to the active priestly service; ideals which Norbertine Communities still profess. So, in 1120 Norbert's first followers put on the white habit of the Order. For a rule of life, Norbert chose the Rule of Augustine, and in effect, produced a community that would be monastic as far as house practice was concerned, and at the same time, apostolic and evangelical when it came to active ministry - that is Canonical life. Norbert had a reputation for being a skilful and inspiring preacher and a man of peace who was always interested in the needs of the people. The Order grew quickly and within 30 years there were 100 abbeys of the Order in Europe. By 1260 the Order had established itself in Ireland. However through the French Revolution the Order dwindled in Europe and the Protestant Reformation nearly destroyed the Order in Ireland. Tongerlo Abbey in Belgium was founded during St Norbert's lifetime and it was from that Abbey in 1924 that Norbertines re-established Holy Trinity Abbey, Kilnacrott, Ireland. Norbert died in 1134, leaving behind an example of ministry minded priests living in community - a model that was to become the norm for Norbertines to come. St Norbert was a great devotee of the Eucharist and Our Lady. In all his efforts as peacemaker and preacher, he kept these two great devotions of the Church before him. It was once said of St Norbert that "he was prepared for every good work." Norbertine Canons in Europe, USA, Canada, South America, Zaire, South Africa, India and Australia are involved in all types of good works including Education, Parochial Ministry, University Chaplaincy and Youth work. Norbertines draw strength from their life of Common Prayer, Table, Chapter and Recreation to enable them to work among God's people to build up the community of the Church.